Medvode, Slovenia and Herentals, Belgium, 7th January, 2014 – Donit Tesnit, one of the leading independent international gasket sheet manufacturer’s, and DISSeurope, an independent sealing solutions provider from Belgium, announced today that the companies are joining forces in order to accelerate business growth and to improve access to strategic international markets and new applications. Donit Tesnit sells its products to more than 64 countries globally and has the largest independent production facility of gasket sheets in Europe. In addition, Donit’s gasket business, operated in Trebnje is the largest supplier of static sealing solutions in the area of Slovenia and its neighbouring countries. DISSeurope, located in Herentals, Belgium is a full service provider for industrial sealing solutions to the Belgium market. The company was founded in January 2013 by Mr. Johan De Sloovere, former BU Manager of Hertel Industrial Sealings. DISSeurope is strategically located in the vicinity of Antwerp harbour with excellent access to large petro-chemical, chemical, pharmaceutical and industrial production facilities. With DISSeurope, Donit gains direct access to the Belgium market for its materials, application engineering and gasket solutions. In addition, Mr. De Sloovere has 20 years of extensive experience and know-how resulting from various leadership roles in the static sealing industry. This will strengthen Donit’s competitive advantage of providing customer focused solutions and technical support to its international client network. DISSeurope will benefit from this new partnership by having direct access to all Donit materials and services, both from the gasket sheet business and the industrial sealing solutions. As part of the agreement, Donit has appointed Mr. Johan De Sloovere, as Chief Executive Officer and Managing Director of Donit. In his new role, Mr. De Sloovere will be responsible for the further developing and implementing of Donit’s global business strategy, both for Gasket Sheets and Industrial Gaskets, and driving forward its international sales and marketing operations. 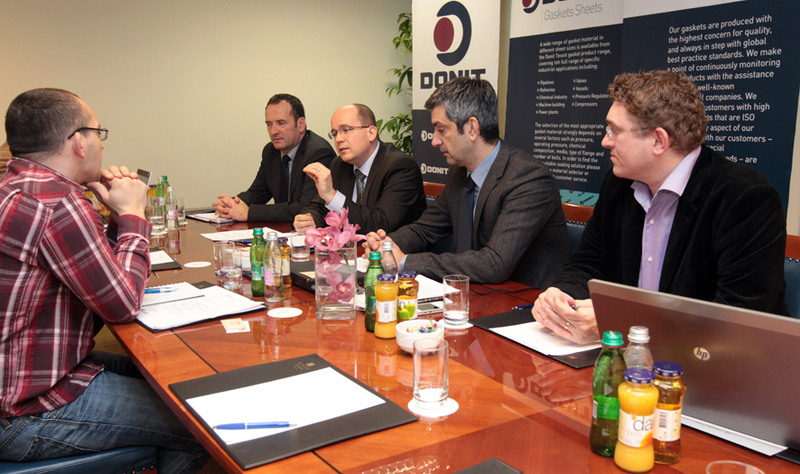 Mr. Zvone Hrovat will take up the position of Chief Operating Officer and continue as Managing Director of Donit. He will be focused on steering the company’s operations in Slovenia so as to secure top quality manufacturing in the production facilities in Medvode and Trebnje..
From January 2014, DISSeurope will become a subsidiary of Donit Tesnit and will continue to operate independently on the Belgium market as DISS (Donit Industrial Sealing Solutions) Belgium. As part of this transaction the new brand DISS (Donit Industrial Sealing Solutions) will also be introduced during the first quarter of 2014 to Donit’s Gasket business operations in Trebnje as DISS Slovenia. Donit is a leading producer of sealing materials, gasket products and solutions serving all major markets. A well-established brand name, top quality (ISO 9001:2000), catering to customer needs and a consistent policy friendly to both people and the environment (ISO 14001:2004) are DONIT’s major strengths. The company keeps a record of constantly growing revenues and currently services customers in more than 64 countries on all continents. Selected Donit customers are worldwide blue-chip companies like: Akrapovič, Atlas Copco, Crane, Danfoss, Eni, Hellenic Petroleum, Grundfos, Lek, Krka, Neste Oil, Petkim, PetroPeru, PCK, Rosfnet, Total, etc… More info at www.donit.eu.